Hours after an immense fire consumed the National Museum in Rio de Janeiro, a crowd of protesters gathered in front of the wrecked institution on last night (3 September) to protest the financial neglect that led to its demise. 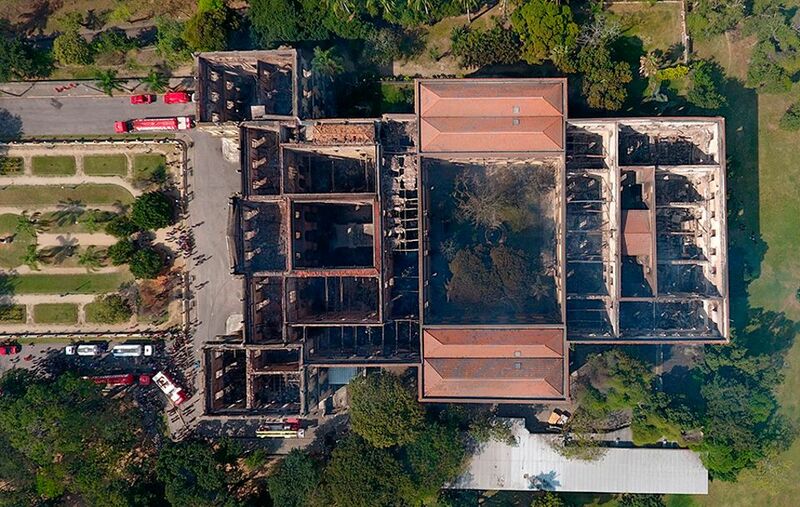 The 200-year-old historical building lacked an efficient sprinkler system—a result of years of incremental budget cuts by the Brazilian government—and was quickly gutted when the blaze erupted shortly after the museum closed to visitors on Sunday (2 September). Police officers shot tear gas at protesters who attempted to the enter the building. The scale of damage to collection and building has not yet been assessed, but aerial photographs of the museum offered little hope, and a video by an anonymous poster showed a grim aftermath. Although the facade of the building has mostly survived, much of the roof collapsed and the interior of the 13,000 sq meter museum, once filled with important scientific and anthropological artefacts, is packed with charred rubble. Less than 40 days before the fire, an architect wrote to the federal public ministry of Rio de Janeiro to report that the building had been neglected and asked for urgent measures, detailing exposed wires and other constructional issues, according to documents published by G1. In the letter, the architect, whose name was withheld, wrote that important archives “could catch fire at any moment and it’s a miracle that [a fire] hasn’t already happened”, adding that “it’s urgent that firefighters visit” the building. Brazilian president Michel Temer and former president Dilma Rousseff are being faulted for a failure to adequately maintain cultural institutions in Brazil like the National Museum, with some accusing them of mismanagement of public funds that flowed to the 2016 Rio Olympic Games and the 2014 World Cup. More than 20 years ago, the World Bank allegedly offered $80m to renovate the National Museum. The offer was reportedly turned down by Israel Klabin, a former mayor of Rio de Janeiro who presided over the Federal University of Rio de Janeiro, which manages the museum, and objected to a condition attached to the donation requiring that the museum be converted to a private non-profit association. In an interview, Klabin writes that the fire was the “result of an archaic model of governance that does not allow the modernisation of the country”. Meanwhile, museology students of the Federal University of Rio de Janeiro have partnered with the Peruvian museological laboratory Museofilia to launch an initiative to build a digital archive of the museum’s collection and are asking visitors to send in photos. Museums across the world, including the Museum of Contemporary Art Chicago and the Smithsonian Institution Archives have stepped up to support and promote the project on social media. Images can be sent to thg.museo@gmail.com. The National Museum was the oldest scientific institution in the country and held around 20 million artefacts spanning 11,000 years, including various early indigenous works of art, the largest meteorite ever discovered in Brazil and the oldest human skull discovered in the Americas, nicknamed Luzia. The status of the institution’s most important works remains unknown.